This aquatic play structure is perfect for any size buccaneer with its small waterslides, spray features, and tipping bucket! 180ft of slip sliding fun on Shipwreck Island at The Cove! 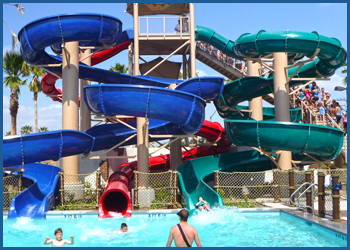 These slides are incredible fun for the taller buccaneers in the family! Set sail in a tube down our Ne’er Endin’ River and float past the Riptide Reef FlowRider, Captain’s Bay, the Crow’s Nest Slides and under the bridge. Wave to your friends and lifeguards as you navigate around Shipwreck Island! 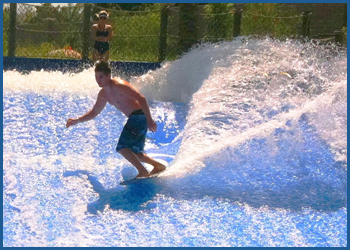 Come shred some waves on Riptide Reef our double sized FlowRider®. This attraction simulates the flow of a wave to allow riders (you) to body board or standup surf! This ride is open to everyone that meets specific height requirements. Our crew members log grueling hours practicing on the FlowRider® in order to have the knowledge to coach riders of all skill levels into challenging themselves to new tricks. Riders wishing to stand up on the ride must sign a waiver at the front desk. Minors must have their parent sign the waiver also. Please keep this in mind when checking in at the front desk. 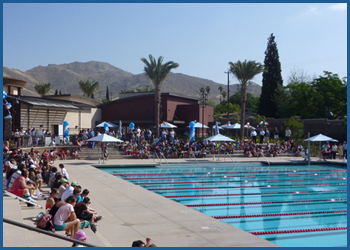 Swimmers, divers, and all aquatics athletes – you have found your home! 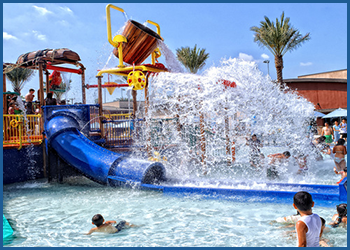 The Jurupa Aquatic Center features a 25-Yard by 35-Meter competition pool. 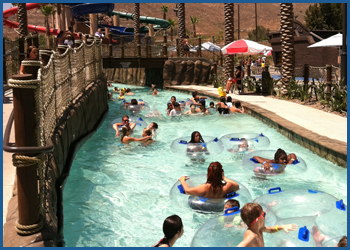 Our standard short course pool can accommodate up to 13 lanes. The starting blocks provide for a smooth dive in. The stadium seating holds over 200 spectators and features wheelchair accessible viewing areas.